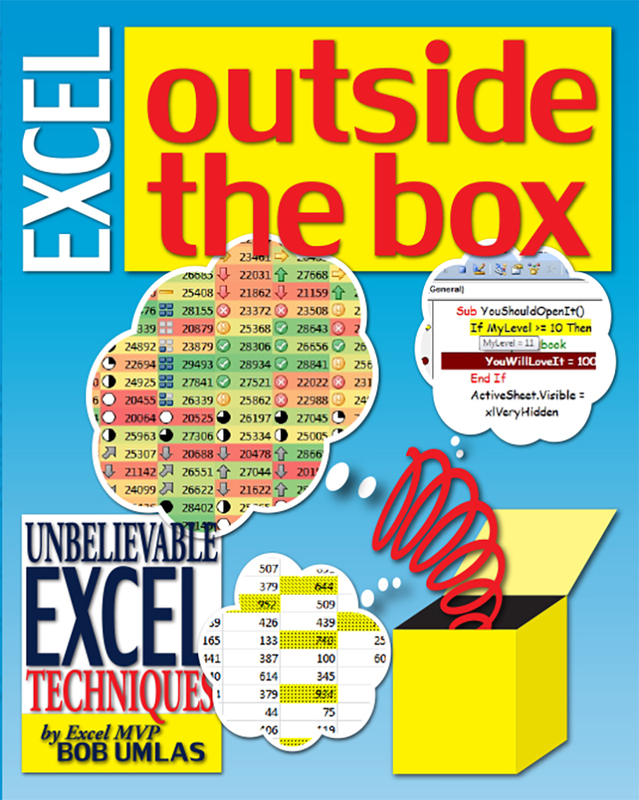 If you're ready for the next level of Excel, then "Excel Outside the Box" is for you! 'Outside the Box' is an in-depth look at 54 amazing techniques from Excel MVP Bob Umlas. Designed with the Excel guru in mind, this handbook introduces advanced and creative solutions, and hacks to the software’s most challenging problems. Through a series of more than 50 techniques, tables, formulas, and charts, this guide details processes that may be used in any Excel application, across all disciplines. Creative approaches for building formulas within formulas, pivot tables, conditional formatting, and mastering array formulas are just some of the numerous challenges explained. Other higher level solutions discussed include using VBA macro code to override cell calculations, solve for sums from a text string, and trimming and cleaning all cells on a worksheet. This is the all-encompassing resource for advanced users of Excel wanting to learn more techniques to broaden and empower their use of Excel.